Yes, you can replace existing icons by overwriting them via CSS. Make sure to check if the existing icon is set via img or background-image and add some CSS to overwrite it with one of the available icons. You can find all available icons and the appropriate selector at the Dashicons Website. Further Reading: There is also a nice in depth tutorial from Shea Bunge about Replacing WordPress Admin Menu Icons. Dashicons to the rescue! Dashicons are the icon font that ships with WordPress 3.8+ by default and powers all the core menu icons. Start by registering a custom stylesheet for your theme's admin-specific styles in functions.php. That icon is the wrench icon from Dashicons that actually looks kind of like the negative space in the default icon. While the color and hover state are probably overkill and actually counter to the reason you want to replace the icon in the first place, I include them just to point out that you can use CSS to styles these icons however you want. Not the answer you're looking for? Browse other questions tagged plugins functions icon or ask your own question. 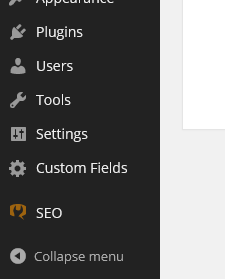 Replacing WordPress Icons (menu,icons32, etc)?